“The History of Man is the history of the sword”. Sir R.F. Burton understood well the importance of combative systems to human society. The primary function of these arts are to dominate and neutralize a threat. Just as important are the traditions, ethics, morals and practically oriented knowledges a young man would also be rigorously schooled in as he transitioned from boy to man. The rise of Modern technological society has led to the marginalizing or extinction of a number of martial traditions and forms of knowledge. This Wisdom, developed over the centuries, would allow a man to deal with any challenge he comes across with respect, honor and efficiency, from harnessing a horse, fixing a fishing net or defending ones home against bandits. These older traditional forms of combative knowledge were once a requisite possession of all men in order to walk the streets with honor and respect. It is with the intent to capture this knowledge that we are traveling to the Island of Barbados to recover the ancient art of Stick Licking. 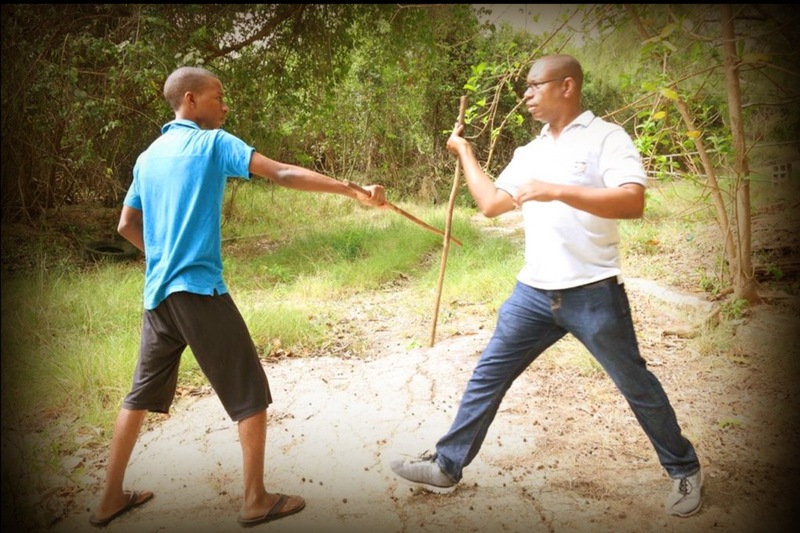 Bajan Stick Fighting or "Stick Licking" as it is known as on the island ("licking" as another term for hitting or beating) was developed out of the warrior traditions of captured Africans as well as their enslaved descendants drive to resist the oppressions of an unjust society. Over a period of a couple of hundred years captured African soldiers and civilians from a number of West and Central African empires and tribes were continually brought to the Caribbean islands where they introduced their own understandings of how to fight with swords, spears and sticks, which then combined with English saber and fencing traditions. Out of this amalgam of knowledge forged in the crucible of combat a number of stick fighting or Stick Licking systems emerged. Out of these innumerable styles only the Johnson and Queensberry styles remain extant today. Stick Licking is much more than just a method to resist oppression, it is a way to teach such attributes as resilience, cunning and humility. It was used to settle conflicts among neighbors without resorting to more lethal weapons like knives or machetes. It was a way for young men to burn off some energy and show off to girls during a time before radio and television. Stick Licking also involved making connections to the spiritual world and the use of music to accompany informal competitions. With the rising popularity of cricket, movie theaters, television and the increasing intolerance for traditional rougher forms of masculine pastimes, Stick Licking slowly faded from popular view. Now many young Barbadians have never even heard of Stick Licking or they think it is something a crazy drunken grandfather would do. As of present there are only three active practitioners left on the island. The opportunity to capture and archive the complete art of Stick Licking is driving a group of U.S. researchers to save this art for future generations of Barbadians and marital artists around the world today. The Immersion Labs Foundation seeks to properly document and archive the rare art form and cultural tradition. By documenting this “language” of movement with the Stick it’s teachings can be archived and transmitted for the people of Barbados and the world, preserving the fighting system for future generations. The footage will be edited together, highlighting the Fighting Style in its entirety and the Bajans (Barbadians) who keep the tradition alive. The finished film will be then be distributed to schools and learning centers across Barbados so that the people can become reacquainted with the art from an outsiders perspective and take pride in what their rich culture has to offer. The finished film will also be showcased in several different museums. This expedition to Barbados is uniting a diverse group, forming a team dedicated to the preservation of disappearing Martial Arts. The Team consists of a wide range of study and expertise such as Anthropology, Filmmaking and Martial Arts. Mahipal Lunia - Chairman of The Immersion Labs Foundation and the guiding force behind this expedition. He works in emerging technology such as AI and loT and has been a lifelong student of the martial arts. Dr. Philip Forde - Professor from the University of the West Indies, who in addition to having a background in Chinese martial arts, began his study of Stick Licking in the 1970’s. Dr Forde will serve as ILF’s main point of contact with other Stick Lickers on the Island. Dr. Michael J. Ryan - Professor of African and Latino Studies at SUNY Oneonta, whose martial art experiences are in Javanese Mande Muda and Malaysian Harimau Beranti Silat, Venezuelan Garrote and Italian combative traditions from Genoa and Apulia. Dr. T.J. Desch - Professor of African and African Diasporic History at CUNY, who has studied side-hold wrestling, Capoeira and Colombian Grima. Vincent Tamer - As Media Director for ILF Vincent will be serving as Director and Cameraman for the Sticklicking archival project. Vincent is also a martial artist, training primarily in Aiki Ju Jutsu. The effort to document Bajan Sticklicking is coming directly out of our pockets. We need help! The total cost of the project (so far) is $10,000. Expenses have/will include Plane Tickets, Lodging and Accommodations, Video Equipment and Accessories and more. Feeling very strongly in the value of this project, this is a privately funded project among members of the groups. However, we need help for this great endeavor to the West Indies! For those donating to our campaign please know that any amount helps and is tremendously appreciated! For those who donate $150 and up The Immersion Labs Foundation will gift the completed finished video of the Stick Licking system, as well as credit the sender of the generous donation in the video production with a special thank you. If we do not reach our goal the funds will still be used to offset the cost of the project and allow us prepare for future endeavors. Any extra funding will go towards future endeavors documenting and archiving disappearing Martial Arts. Spread the word! Tell your community about this project. If you practice Martial Arts, share it with your teacher, if you study Anthropology mention it to your professor! This multi-disciplined project can be of interest to a wide body of people! Interested in a Media Internship? ILF is seeking two dedicated Interns!